So Terri of Chasing Dreams left a relatively simple comment the other day. And congrats on paying off that credit card. My suggestion – unless it’s the only one you have, I would say to now cut it up! So I began to think about why I’ve been using the cards so much. Well through one of the store I frequent I get an additional % off if I use my card. In some cases that can be as much as 20%. In addition I get an extra % off thanks for my employee discount. So suddenly that $1000 has dropped to $600 instead of $750. Aside from my extra payment debacle that’s a decent chunk of savings. Though you are right, I did spend a little more than I might have with just cash / a debit card. 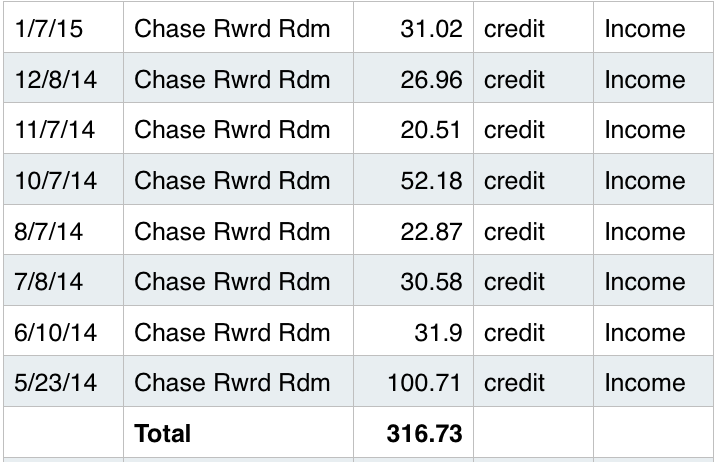 $316.73 in bonuses for using my card. Sounds pretty good right? That could be a nice flight somewhere or about 18 full tanks of gas at current prices. I don’t have how much I actually had to spend to get that back, but an argument could be made that is was more than I might have with cash / debit. Currently I get about 5% back on grocery store purchases with card and 1% back on everything else. When I buy gas at costco I also get the cheapest gas in the area and a few % back. It’s not “free” money because the merchants have to pay an additional percentage which in turn drives up what consumers pay, but I still like getting a kickback for something I would have purchased anyway. Credit cards also have served as a buffer for when my cash reserves were low at various times.That’s not the way it should be, but it sort of is the current reality. Until next month at least. 🙂 Thoughts? Keep working on that emergency fund so that you don’t need to use the credit card as a buffer. It is such an empowering feeling. I just applied for a credit card the other day for the first time in two years, and it’s just because I know I will need it for a few things like renting a car, etc. But I plan on not even carrying it in my wallet, and just keeping it in my freezer, encased in a block of ice. It’s also because my emergency fund is in an online account that takes 2 business days to transfer over to my regular-use checking account. And yes, if you’ve heard Dave Ramsey talk about it, people really do spend more when using plastic (credit or debit) than when using the good old cash. I myself still use my debit card because I don’t trust myself with cash in my wallet. I’m eager to hear how your view might change over the next few months – you’re making good strides, keep it up!